China Preps For Its Big Spring Clean, As The Tomb-Sweeping Festival Approaches : The Two-Way People in China are preparing for Qingming, a national holiday to celebrate ancestors that dates back millennia — but was banned for decades and has only recently been reinstated. A mourner walks through a cemetery in Jinjiang during the Tomb-Sweeping Festival in 2015. Now that the trees are easing into their green, many people in China have the past on their minds. The millennia-old spring holiday known as Qingming — or Tomb-Sweeping Festival — is at hand. 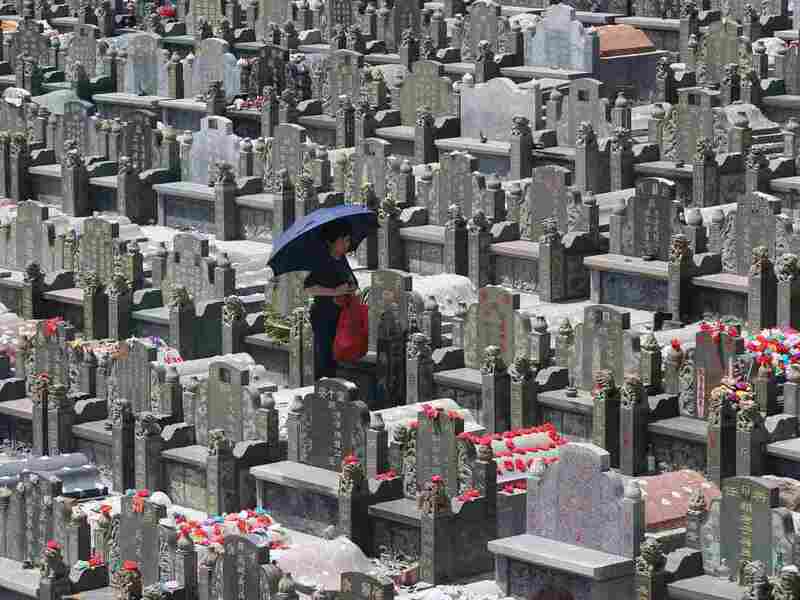 Every year around this time, typically on April 4 or April 5 on the Gregorian calendar, China honors the dead by taking a few days off and returning to ancestors' grave sites. There, as the holiday's name suggests, they break out their cleaning tools and get to work ensuring everything is in fine order. When they're not flying kites on the occasion, families often place offerings of food at memorials, pour out wine and lay some budding willow branches to welcome the arrival of spring. These celebrations of life — lives past and life renewed with spring — are commonly accompanied by acts of destruction. 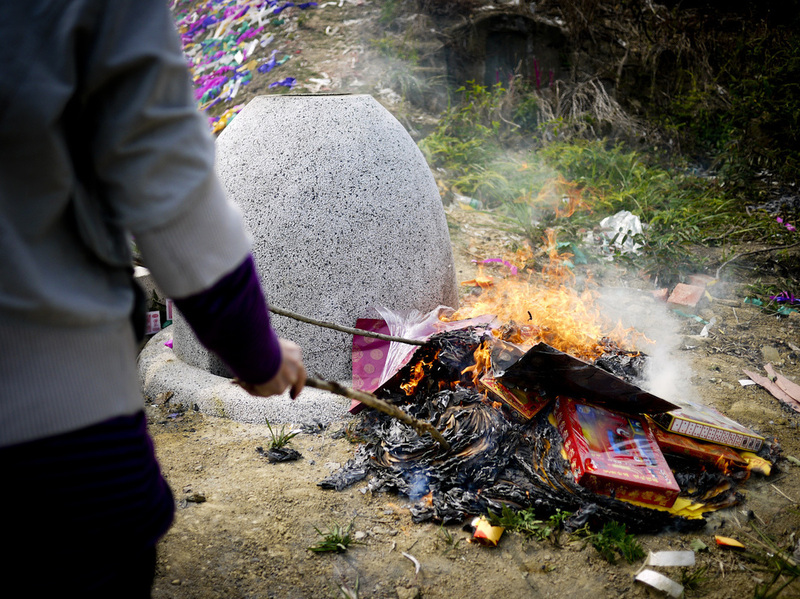 NPR's Anthony Kuhn notes that many people burn fake paper money for their ancestors to spend in the afterlife, often going so far as to set ablaze effigies of modern luxuries like cars and iPads. During the festival, celebrants commonly set fire to effigies of modern conveniences like phones. This concurrence of old and new has shaped the festival's recent history, too. For a holiday that has evolved over the course of more than 2,500 years, it's modern iteration is actually quite young. The country's 1949 Communist Revolution ushered in decades of discouragement under regimes that viewed the holiday as a bourgeois habit that needed to be stifled. It wasn't reinstated as a national holiday until 2008, when the Chinese government set aside some time each year for people to escape their jobs, pack their things and commemorate the past.
" 'Cherish the memory of our revolutionary martyrs,' was the first item on the message. 'Don't forget their heroic undertakings,' it continued. 'Carry forward the spirit of the Chinese people. Look forward to the great rebirth of the Chinese nation.' "
And then there's a less-poetic way that the holiday has been changed by the decades. Even as more and more people have filtered into big urban centers, the plots of land where these city folks' relatives remain are still in the country. Anthony explains. So, like Americans packing into cars for Memorial Day trips, many Chinese will pile into their vehicles and battle the traffic back to hometowns they haven't seen for some time. Luckily for them, at least, they won't have to worry about the tolls: Those little roadway annoyances are suspended for the holiday.